Welcome to Pour Sports Bar & Grill in Portland. Formerly a salsa bar, manager Dani Dindia has transformed Pour Sports into a quintessential sports bar worthy of handling anyone’s sports viewing necessities and a whole lot more. Fifteen beers on tap along with a full cocktail bar complement a menu with a variety of food options including a list of employee selections. 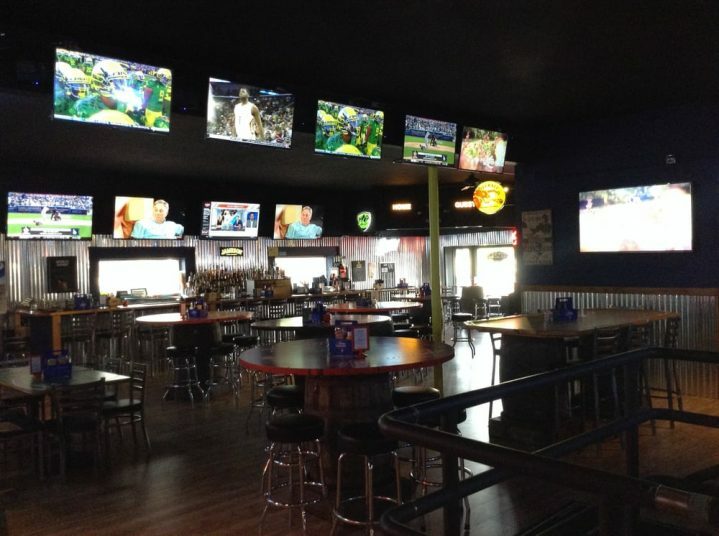 Along with an excellent menu and wide selection of beers and drinks, Pour Sports has the characteristic entertainment which any sports fan can appreciate; free WiFi, Big Buck Hunter, Golden Tee, a pool table, and video poker. There are plenty of flat screens (14) to provide a view for every seat in the place. There is even a “lounge” section which includes couches and coffee tables highlighted by two strategically placed touch-tap lights which patrons can use to get their server’s attention. A nearby parking lot is free for Pour Sports customers after 5 p.m. on weekdays and all day on the weekends alleviating the scant street parking typical of any downtown Portland business. In addition to being an ideal venue to enjoy a variety of entertainment options, this establishment also has drink specials and events for every day of the week. There’s Movie Monday, Texas Hold ‘em Tuesdays, Trivia Wednesdays, and Karaoke on Thursday and Friday. Happy hours are from 3-6 p.m. and 10-12 p.m. on weekdays. Also, for you Blazers fans, Pour Sports is located just minutes away from the Moda Center and is directly on the Portland Streetcar route. All of these features would be enough for any sports bar connoisseur; however, Pour Sports has one more highlight that makes it stand out, The Escape Room. The Escape Room is a small area located downstairs from the main bar area. For $25 per person (Groupons available for event specials) a group is immersed in a “Speakeasy” themed environment which has been discovered by the authorities. Your group has one hour to escape the speakeasy using numerous clues garnered from solving various puzzles contained in the room. If you fail to make it out in time, the “coppers” arrive and “arrest” you, complete with your mugshot which is placed on the wall of the Escape Room as a warning to future adventurers. I have just recently discovered this sports bar gem and it has already become one of my favorite haunts. I look forward to enjoying all of the experiences this bar has to offer, as should you.